I threw open the invitation to all to submit their Week in Dinners last month and having seen Cara’s Joan Mulvihill commented on facebook so I asked to to share hers too, and here it is! 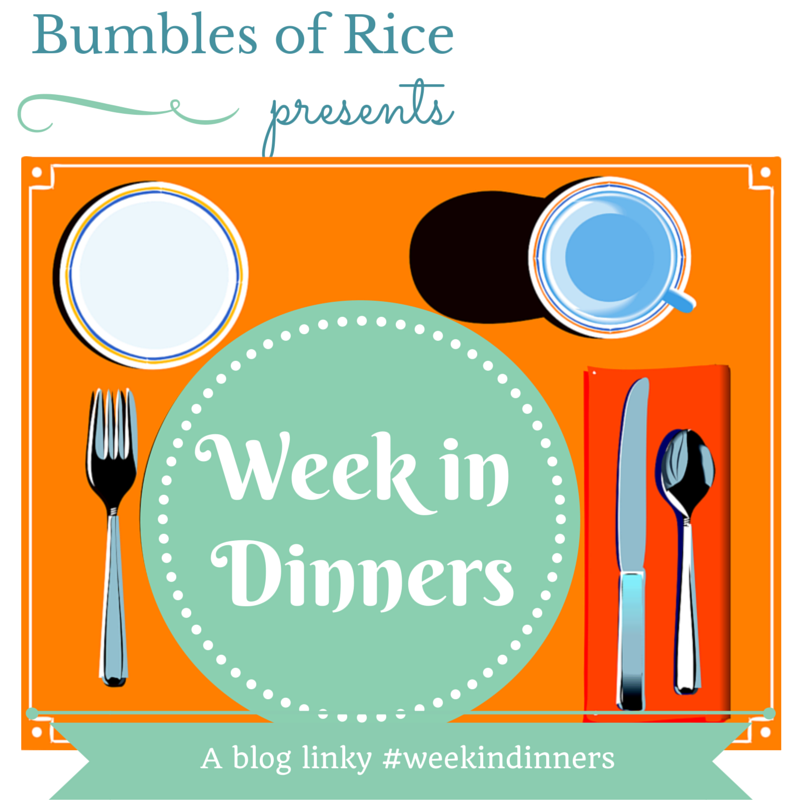 If you’d like to share your Week in Dinners, on a normal week, nothing fancy then contact me through the comments here on on the blog facebook page or by email to bumblesofrice@gmail.com. Joan mentioned in her message that she’s cooking for one so I think it’s great to get this perspective. Over to Joan. So my week in dinners is a pretty poor indictment of my culinary skills and more a reflection on the random nature of my evenings. A weekly grocery shop is a real case of optimism over experience as I never know how the week is going to pan out so I tend to shop day by day to avoid throwing stuff out. I know, I know, but cooking for freezing is beyond my planning inclinations. As I have a bit of osteoarthritis I tend to eat a lot of oily fish as its good for my joints and I’d rather eat the food than take the supplements. Sunday was a good start to my week in dinners as I cooked a HUGE trout filet (just in tinfoil with some lemon, parsley, salt and pepper seasoning), broccoli and potato and carrot mash. (The mash was from Supervalu, pre-cooked and mashed – am skilled with a microwave and there’s only me there’s no point doing all that prep for a single portion!). Monday was gym night so I’d eaten a big lunch during the day for fuelling purposes. By the time I got home I just want something light and I don’t have time for cooking at that stage of the evening anyway. Rocket, prawns, cherry tomatoes, avocado salad with Lemon and Mustard dressing. (All from Tesco Metro on the way home – I eat this combo a LOT!). Tuesday wasn’t much better. Again, I got home late from work, I was even too tired to shop and so took a wholewheat Bagel from the freezer and had breakfast for dinner – scrambled eggs on a bagel with some Ballymaloe relish. Stop judging me, its pretty healthy really – carbs and protein! Proper dinner! Roast chicken with all the trimmings. Naturally, I didn’t cook this myself – I called in to visit my cousins on the way home and arrived right on time! Thursday and I’ve still not managed to do much actual cooking. I was at the gym so I had lunch midday at Crackbird to make sure I had enough energy to work out. By the time I got home it was late and I was weak (not with hunger but with resolve!) 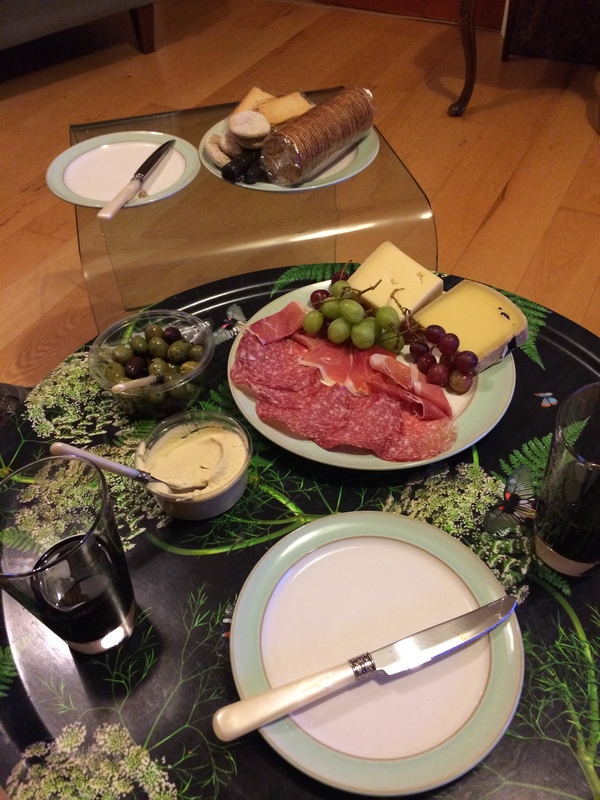 so when one of the neighbours said to pop in for girls, chat, wine… it sounded like a splendid idea. I live in extremes of famine and feast. Friday was Feast day! I was taken for a lovely working lunch at Dax. I had the Hake (more fish!) and later that night I was catching up with a friend who was home from NY for a few days. You can’t have a quality catch up like that without a glass of wine and the wine was accompanied by amazing Tapas (that great place in Ranelagh!!) so I squeezed in some more dinner even though I was still pretty full from lunch! So that’s my #WeekInDinners. I’ve made it through an entire week having only cooked one real dinner. I managed to dirty two saucepans (the broccoli and the scrambled eggs), ate out twice and had two girl’s nights – and a salad. Thanks Joan for sharing your honest week in dinners, I think we all have weeks like this where we realised we’ve barely cooked, they are often the best weeks, but not ones that people tend to share. It’s great to get real life dinners publicised. dinner for one, dinners, other people's week in dinners. Bookmark.